Compare Multiple Sheets Wizard quickly finds and highlights differences in two or more Excel lists or sheets. You will select the main worksheet and the sheets to compare it with and find different values, formatting, or formulas. The differences can be highlighted with border, fill, or font color. Also, the tool can consider leading and trailing spaces while comparison. Compare as many sheets as you want Select the main worksheet and as many sheets to compare with it as needed. Find different cells Make all different cells visible by highlighting them with the color of your choice. Review or ignore empty and hidden cells You can include hidden and empty rows or columns into the comparison. Disclose different formulas and formatting Find differences in formulas or formatting by checking the corresponding options. Identify unique rows See at a glance all rows that are absent in the main sheet and are present in the compare sheets, or vice versa. Select how to mark differences Choose the way to identify the found differences: background color, font color, or bottom border. 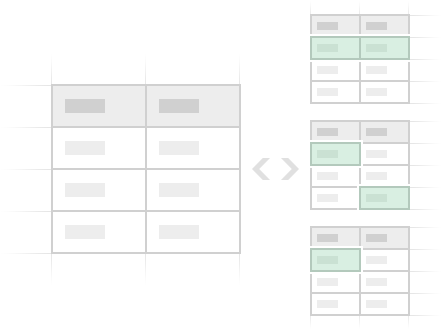 Consider the spaces or not If spaces matter, select the corresponding option to consider leading and trailing spaces while comparing the sheets. Pick a hue for the differences Select the most appealing color to highlight all the found different cells in your worksheets. What is Compare Multiple Sheets Wizard and what do I need it for? 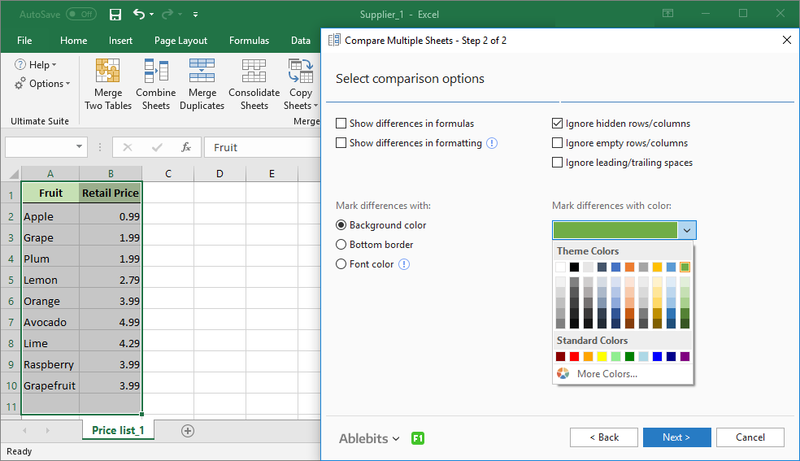 Compare Multiple Sheets Wizard is part of Ablebits Ultimate Suite for Excel. 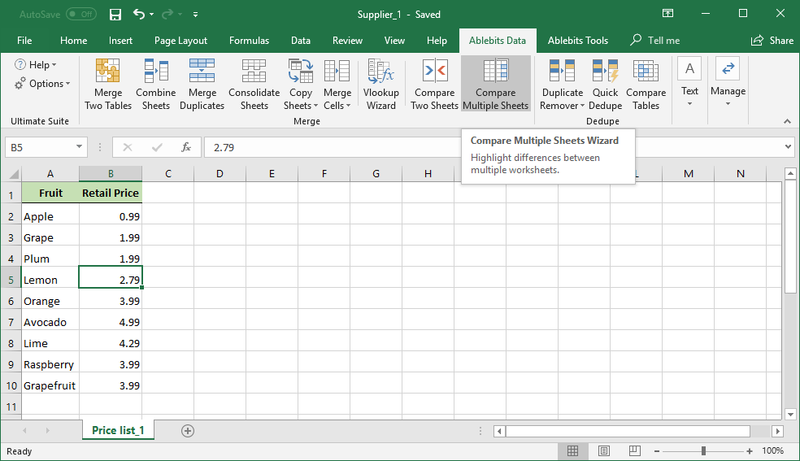 It will help you find and highlight differences between two or more Excel sheets. The tool checks the sheets for differences in values, formatting, formulas. The different cells and rows are highlighted with the color you choose. How to compare two or more Excel files and highlight the difference? Make sure that all the workbooks that contain the sheets you are going to compare are open. Go to the main sheet – it is the sheet the other worksheets will be compared to. On the first step, the tool automatically selects the current sheet as the main one. It is up to you what to take for comparison: the entire sheet, the selected range, or the current table. Next, select the worksheets to compare: the differences will be marked only in these sheets – the main one will remain intact. On the final step, pay attention to the additional options and select the color to highlight the differences. Find a more detailed instruction here. Can I compare several sheets from multiple files? Of course. 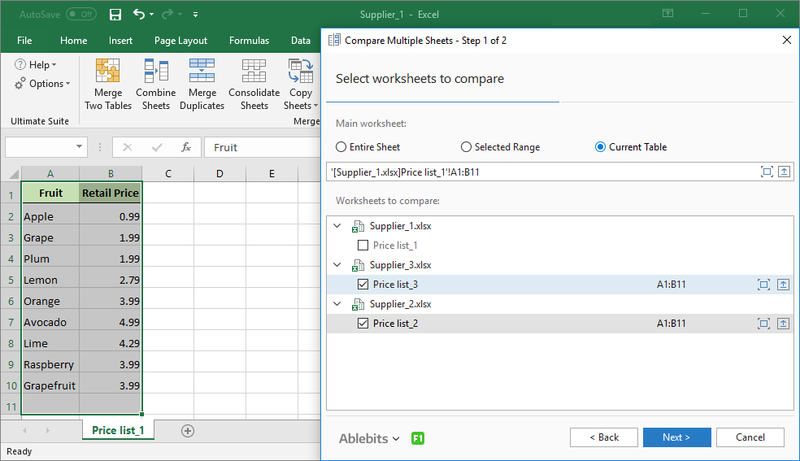 Your sheets can be either in the same Excel file, or in different workbooks. Are the differences highlighted in all the sheets I compare? Not really. The differences are highlighted only in the compare sheets. The main sheet remains intact – it is the sheet the other files are compared to. If you are looking for a tool that compares two files for differences and matches and marks them in both sheets, have a look at the Compare Two Sheets tool. Can I compare sheets that contain merged cells? Unfortunately, no. The wizard does not work with sheets that contain merged cells, so please unmerge them before starting the utility. What if I need to find differences in formulas? No problem. Check the Show Differences in Formulas box on step 2. But please do not compare tables that contain volatile functions, as they return different values each time Excel opens the worksheet. Such functions are RANDBETWEEN, OFFSET, INDIRECT, NOW, TODAY, RAND. Besides, CELL and INFO can be volatile depending on their arguments. Can I find differences in formatting? Yes! For this check the Show differences in formatting box on the second step. What if my sheets to compare have conditional formatting? 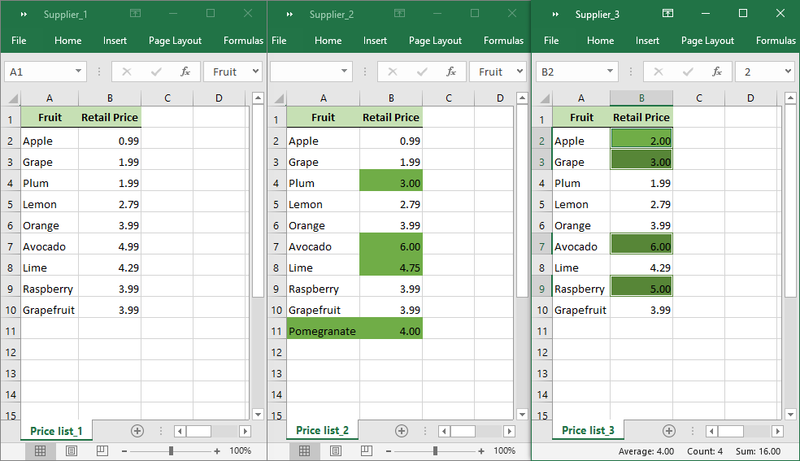 It is ok, but be aware that the tool will make some changes to your cell formatting (depending on your choice: borders, fill, or font color) and that may conflict with your existing conditional formatting. Is it possible to ignore empty cells? Sure, you can ignore or consider empty columns and rows by checking or unchecking the corresponding checkbox. I have hidden rows in my sheets, can I still compare them? Yes, you can. By default, the tool ignores hidden columns and rows. If you want to consider them, just uncheck the corresponding option on step 2. But until you don’t unhide these rows, you won’t see the found differences there. Does the wizard consider spaces in my data? By default, Compare Multiple Sheets ignores spaces. But you can uncheck the Ignore leading/trailing spaces box and the tool will consider them while comparing multiple sheets. How does the tool mark the differences? You can select one of the following ways to highlight the found differences: bottom border, background color, or font color. Also, you can pick the hue.